DRAMAtical Murder and Nitroplus Online Store's 5-Year Anniversary Celebration Collaboration! Nitro+CHRiAL's fourth release "DRAMAtical Murder" celebrated it's 5th anniversary on March 23, 2017. And Dec. 11, 2017 marks the 5th anniversary of the Nitroplus Online Store. To celebrate, "DRAMAtical Murder" and the Nitroplus Online Store have collaborated to bring you this very special item! 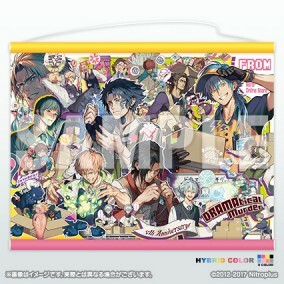 The illustration was provided by "DRAMAtical Murder" original art and character designer Honyalala. The incredibly detailed drawing shows the characters involved in the planning, creation, and distribution of their own game. This tapestry also features hybrid color printing. An increased range of colors allows for even more faithful image reproduction, as well as enhanced appearance of texture and depth. * What is hybrid color printing? A significant improvement on conventional 6 color printing, both orange and grey inks have been added for a total of 8 colors. An increased range of colors allows for even more faithful image reproduction, as well as enhanced appearance of texture and depth.